……….and firm as an egg. Falling away into potsherds, unfired. Falling away into sand, into clay. ~ by bonniemcclellan on April 8, 2013. These lines show a very close observation of pottery processes; most interesting and thought-provoking. I find those photos equally fascinating and the perfect complement. Thanks John, my husband is a sculptor and I helped him slip-cast a group of these terracotta hands for one of his projects. The fragility of the greenware in contrast to the fired clay was one of the inspirations for this poem. I also found the plaster mold a fascinating object and couldn’t resist photographing it. Wow. Very apt as I have been coming unglued here lately! Oh no, pull yourself together and get fired up! 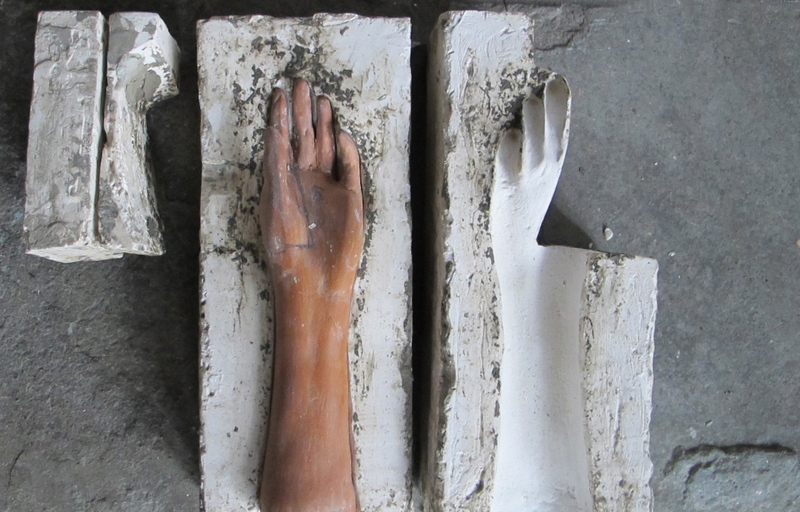 I was in the process of making these terracotta hands for Matthew when I took a train trip to a town up the way and was watching all of the ladies of different ages looking in their compacts as they started to arrive at their destinations…we’re all coming unglued, just in different places.